It was observed for years that facial fat transfers resulted in not just increased volume, but improved skin texture and quality. Over the last few years we've learned that this improvement is due to the quantity of stem cells & other growth and healing factors that are contained in fat. Stem cells, and probably even more important, some of the growth and healing factors found in fat, have the ability to stimulate the regeneration of different types of tissues, including cartilage, muscle, bone and fat. When stem cells and healing factors and are obtained from your fat or your bone marrow, and then injected back into your body, they're attracted to the signals coming from areas of injury or disease. The multiple substances included with and/or released by the stem cells have shown promising results in multiple medical conditions including severe arthritis & orthopedic injuries, cardiac disease, multiple sclerosis, Alzheimer's disease, spinal cord injuries, diabetes, autoimmune diseases, and more. In musculoskeletal conditions, stem cell treatments have been successfully used to promote healing of fractures and, when injected into injured or degenerated knees, elbows, shoulders, and hip joints, to stimulate cartilage growth, decrease pain, and increase function. Many people still don’t know that bone marrow transplants, which have been safely used since the fifties, are a type of stem cell therapy. After World War II and the atomic bomb, research was begun to find a way to replace bone marrow destroyed by radiation, since without bone marrow, blood cells aren’t produced. Bone marrow transplant therapy was eventually developed that restored blood-making capabilities and was successful because of the rich source of stem cells in the marrow. It’s now known that stem cells are found in multiple sources in the body, but two of the richest tissues in adults are bone marrow and fat. Fat makes up around 15-20% of the body weight of an average person and most people wouldn’t mind sacrificing a few ounces. Obtaining fat through a mini-liposuction procedure is relatively simple, and fat contains more mesenchymal stem cells (that can differentiate into multiple types of cells) than does bone marrow, especially after middle age. Since many of our patients are seeking aesthetic treatments to correct the results of aging, they're also at an age where they may have arthritis or other degenerative problems. Because I had patients and family members with severe arthritis in their knees who were looking for alternatives to knee replacement surgery and I had over 30 years experience performing joint injections, I began providing this fat-derived healing factor treatment to my current patients about five years ago. The first person that I treated with stem cells and healing factors isolated from fat was my uncle, who had severe bone-on-bone arthritis in his knees, to the point of deformity, and had been postponing knee replacements for over a year. Immediately after the treatment, he was up walking, and he rode his bike the next morning. Now, four and a half years after a single treatment, he continues to rate his knee pain and functional improvement at about 85%, and plans on repeating the treatment when he can no longer ride his bike around the neighborhood daily. Another patient who I treated owns a construction company, and after I’d treated his severe knee arthritis and achilles tendonitis with fat-derived stem cells & healing factors, he sent me one of his most valuable project managers, who had been told he needed both knees replaced. I used some of his fat to isolate the healing factors, injected it into his knees, and he was back at work the next day. Individual results vary of course and most people are fairly sore for a few days where the fat was removed. Our patient immediately after a stem cell/healing factor injection to the bone that was breaking down above his knee replacement. 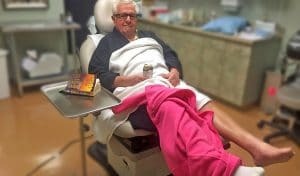 My eighty year-old dad had both of his knees replaced about fifteen years ago, before stem cell treatments were an option. He'd developed pain and a thinning of the bone (called osteolysis) just above one of his knee replacements, and had been told that he'd have to undergo another knee replacement surgery. In Feb. of 2017, I took some fat from his abdomen and removed the stem cells and healing factors. After anesthetizing the area, I injected them into the area where he'd lost bone above the replacement. Starting a few weeks after this treatment, his pain in that area was gone and an MRI done five months later by his orthopedic surgeon showed that the bone had grown back where it had been thinning previously. His orthopedic surgeon is a proponent of stem cell treatments and had been supportive of his choosing to try a stem cell/healing factor treatment instead of another joint replacement. Fat-derived stem cell/healing factor treatments are still investigative procedures, and like all medical treatments, have no guarantees and some risks, but a recent article (J Clin Med Res. 2017;9(11):935-942) showed a strong safety profile from a multi-center analysis of 676 patients receiving adipose-derived stem cells and healing factors for multiple degenerative diseases and injuries. I definitely don’t have anything close to the knowledge or experience an orthopedic surgeon or experienced regenerative physician has, and I recommend that patients interested in these treatments consult with one first if they'd like to pursue this option. Our goal is to help people look & feel better both from the outside as well as the inside, so we offer regenerative therapies including fat-derived stem cells & PRP (platelet rich plasma). The procedure for fat-derived stem cell therapy involves obtaining a few ounces of fat by mini-liposuction done with local anesthetic, separating out the stem cells from the fat, and returning them either by IV or injection. The entire process takes less than three hours.The stem cells obtained from the adipose or fatty tissue processed in the laboratory at Skinspirations can be added to more of a patient’s body fat for injection immediately to make the injection more long-lasting, or they can be frozen for future use in a variety of medical applications We also can send the harvested stem cells to a stem cell storage provider to be available for the patient’s future needs. Schedule a complimentary consultation at Skinspirations by registering online here or by calling 727.571.1923.